Breathe deep … and as you let go of your breath, follow it down, and notice the Space between your breaths. Don’t hold it, just notice it. And again, breathing deep, letting go, and following the breath down to this Space – that is always with you, feeling it. Breath deep … and as you let go, noticing this Space – into which all who have gone before us have travelled … from which to enter again the dance of life in some form. Feel this Space between your breaths. Samhain is a profound celebration of the Void – the Void before time, the Space between one exhalation and the next inhalation, the All-Nourishing Abyss, the Sea of Generosityfrom which all pours forth, the quantum vacuum. 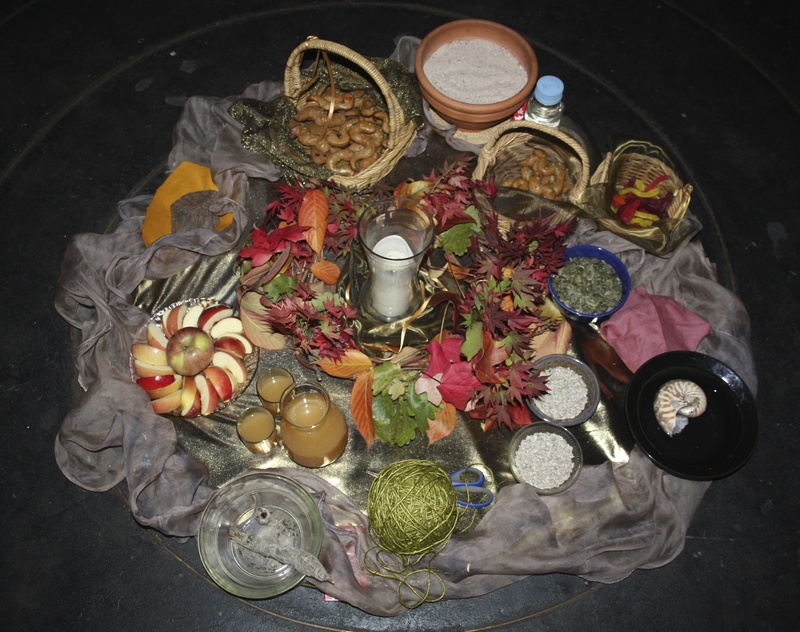 It is regarded as the time for remembering the ancestors – those who have gone before us: from the point of view of Gaia/All-That-Is, death is a transformation … Samhain is a time for remembering this, and for being done with the old and conceiving the new. It is a time for recalling the many changes each of us has come through in our particular lives, the many skins we have shed. And we may recall the many cultural changes of our human story, the many evolutionary changes – Gaia’s transformations, which are also ours – anywhere in the spectrum of thirteen point seven billion years. We can remember how old we really are, and we can remember that we are yet “much More” – personally and collectively, as may be stated in the ceremony. We may articulate some of these conceptions. This is the autopoiesis of the Cosmos , in which we participate: that is, Her sentient capacity, the “Well of Creativity”, where spontaneities seethe in the quantum foam. Samhain is often understood to mark the New Year in Earth-based tradition because it is the meridian point of the darkest quarter of the year, between Autumn Equinox and Winter Solstice, when the dark part of the day is longer than the light part, and is still on the increase: and it is in the dark that the new is conceived. Much like any New Year, when “re-solutions” are made, there is particular magic felt in this moment; all is possible, one could decide anything and will it to be – so, it is. This is of course true of every moment, though it may be felt more profoundly at this time of year in your region, and this celebration can remind one of that. snake – representing chthonic life-force and regeneration. gold fabric – representing transformation, which death is from Gaia’s perspective: and ribbons/threads of gold – which are in the compost if one has the vision for it. natural fibre string – for weaving the new, and it is meant to represent the spider’s fibre from her own body, with which we may identify our own passions to create. scissors – for cutting: a tool of the Old One for ending things, but also freeing. thin fabric – representing the thin veils between the worlds, felt particularly at this time, though always true. I associate the whole dark part of the Wheel of the Year with the Crone/Old One quality, She who Creates the Space to Be as I name Her, understood as the realm of manifesting; and Samhain is particularly associated with Her process of the Transformation of Death – the breakdown of old forms, the ferment and rot of the compost, and the possibility of renewal. It is remembering how we are indeed formed by Her, and in that sense conceived by Her: She is the Dark Mother. It is what I call a “trans-genetic” fertility– I mean it as “imaginal fertility”. It mirrors the fertility and conception of Beltaine – the genetic fertility of the light part of the cycle (which is happening in the Northern Hemisphere at the same time: they are never really separate), when the Young One/Maiden is maturing: who is the Urge to Be, as I name Her. At Samhain, I like to dwell for a while on the power of conception. Conception could be described as a “female-referring transformatory power”, as Melissa Raphael does in Thealogy and Embodiment (p.8-9), and which I draw out in PaGaian Cosmology (p.56-57). ‘Conception’ is identified as a Cosmic Dynamic essential to all being – not exclusive to the female, yet it happens in a female body. It is a female metaphor: one that patriarchally based religions have either co-opted and attributed to a father-god (Zeus, Yahweh, Chenrezig – have all taken on being the ‘mother’), or left out of the equation altogether. Womb is a place of Creation – not some God’s index finger or head! Melissa Raphael speaks of a “menstrual cosmology”: “an ancient cosmology in which chaos and harmony belong together in a creation where perfection is both impossible and meaningless”. And one may note the resonance of this with recent Western science’s understanding of chaos, as being essential to order and spontaneous emergence. For ages (literally) fertile things have been described as “seminal”, because it was believed that the male contribution was the seed, and it was the important one: Western science did not recognise the female seed – the ovary – until 1827 and then paid it little attention. Western philosophy and language has blatantly expressed the female as passive in regeneration and that she only provided the inert dirt (soil had no active integrity either) for the all powerful male seed. Androcentric bias has almost obliterated the notion of ovarian fertility. Samhain is a time when all this may be re-membered, placed into the Poetics of the Season. The Old One is the Wise One who remembers, and from whose Sentient Depths the new is drawn forth. Imagined conceptions may gestate in the fertility of the Old One’s growing dark, and the movement is towards the fullness of the Mother’s dark Womb of Winter Solstice, towards syntropy – towards manifestation. The Creative Dynamic of the Cosmos happens within each being … we are all the Mother, co-creators with Her, no matter what your gender or species. The traditional story as Starhawk tells it (1999: 210) is in terms of later Pagan traditions, as the journey of the God across the Womb of the Mother Goddess – “the sunless sea” – to his conception, “the Shining Isle”. Yet we are all Journeyers – are the Seeds of our own re-birth … the Persephones who have, and do, descend. We are all She /Goddess/Gaia – Whose face changes, and we all may “conceive” in the Womb of Being – in our bodyminds. At each moment there are a hundred million million tons of living matter in the biosphere, always in a state of movement. The mass is decomposed, forms itself anew…. Generations are thus born at intervals of time from ten minutes to hundreds of years … through death, birth, metabolism and growth … unceasingly. … form and formlessness are continuous and there is no “away”. Light and dark are held in one embrace in the sphere of the Moon – yet always moving. This place that we live within is a constant interchange, a reciprocity, like a breath. Rigid hard boundaries are an illusion … at anytime, but it is recognised more in this season. The realms of the manifesting and manifestation, the rich fertility of dark and light, conceptual qualities of Old One and Young One/Maiden are held in the same embrace … the Wheel of the Year may teach us that when we attend to it: and the sacred interchange between them is this sacred Place of Being, this Communion, this Event, which comes and goes in every moment. Samhain may be a profound celebration of that and our power to participate consciously: may we find Joy in our co-creation. to the fertility of the dark. Allowing a new pattern to emerge. to guide my ship by. Glenys Livingstone Ph.D. (Social Ecology), is the author of PaGaian Cosmology: Re-inventing Earth-based Goddess Religion. She lives in the Blue Mountains with her beloved Taffy Seaborne, where they have built a Goddess sacred space – MoonCourt, and where she facilitates the Seasonal rituals and teaches. Livingstone, Glenys. PaGaian Cosmology: Re-inventing Earth-based Goddess Religion. Lincoln, NE: iUniverse, 2008 (2005). Swimme, Brian. The Universe is a Green Dragon. Sante Fe NM: Bear & Co., 1984. A term used by Brian Swimme,The Hidden Heart of the Cosmos, Ch.13. This name is from the poem Divine Flashes by Iraqi, referred to in PaGaian Cosmology, p.136. Brian Swimme also speaks of how “all being has gushed forth because Ultimate Generosity retains no thing”, The Universe is a Green Dragon, p.146. The Cosmos and daughter Earth are not “its”: they/we are alive. a term used by Thomas Berry: see principle # 9 Appendix A, Glenys Livingstone, PaGaian Cosmology, p. 266. See Irene Coates, The Seed Bearers. Usually the word used is “reproduction” – but are we machines? “germinal” is a gender-free term, but it is good to use “ovarian” instead of “seminal” for a long while just to get some re-thinking started. Vladimir Vernadsky, The Biosphere, p.34. “Samhain” by Glenys Livingstone, 1995 C.E., with additions 2007 C.E.